Its been a busy week and I have been trying to get to a blog post. My goal was to get another done before the month was over.... and so here I am just squeaking in under the wire. First of all, I have been working on setting up a new online store front at Etsy.com and after a steep learning curve I'm happy to announce the opening of ThrumsTextiles. Its still a work in progress and I'll tweak it as I learn the ropes but the doors are open. I'll post a link to it on the side bar shortly. We have been busy at home with getting the gardens trimmed down for winter and putting things away. Its being done a month early this fall due to hubby's knee surgery this coming Friday. In fact we have been tying up a lot of loose ends (and one was waiting on us for nearly 30 years!) Feels liberating to be crossing things off a 'to-do" list. We also did a fast and fun trip up to Comox and had a lovely dinner and overnight stay with Lynnette and family. We did take our cameras along but we got to gabbing and such and clean forgot to take them out. They have done a marvelous job of landscaping their front and side yard and the new trees and shrubs looked wonderful. There is also a custom built garden shed and pergola and plans for much more. They will be harvesting veggies from their planned garden in the next year or so and shaping the yard for their needs. Despite the light rain, we stopped at Goats on Roof in Coombs. We had a nice lunch and browsed the store for all kinds of goodies and I *loved* the British Foods section and loaded up on some of my favourites. It was such a nice diversion from all the ongoing work around here, and the inevitable worry of a surgery! So weaving news? Well, I'm hemming waffle weave towels right now. I have six for the inventory and one (with the only treadling error) for us and our kitchen. Anyone who looks at the towels in my kitchen drawer will think I 'm a lousy weaver as they all have a mistake! ...finally I saw the knots come over the back beam. You put a big push on when when they appear! Apart from running out of my royal blue and having to order more yarn (forced to in fact!) it was uneventful weaving. Of course the new blue did not match the old blue but I had placed markers in where the change occurred. How's this for maximizing my mileage? The cut ends on the loom waste measured six inches, plus the tie on portion and it came to twelve inches total. That's the best ever! I budget 21 inches for loom waste in the planning so the extra inches woven was a bonus. You know, its hard to convey in pictures or words the nice hefty bolt that came off the loom! I could run it down a hallway and try to photograph it, or make it into a nice roll like the one above. I wish I could share with you the weight of it and the evenness of the pattern when it runs continuously. You just want run a hand over it. The white markers show the transition line. The new yarn was a darker blue, and actually I liked the two blues mixed together like that. It was richer somehow. The plan was to pull a couple of threads every 34 inches and then cut the towels apart using the serger. That had to change when I pulled a couple of threads and couldn't see where I had done it! The long floats of the weave structure camouflaged the line. So I resorted to measuring and snipping the edge where the line was. With the nice tidy rows and boxes, I had built in guide lines! Once serged apart, I folded and pinned the hems. On the towel that is for us (the one with the goof up) I machined sewed the hem. I discovered why I don't sew or make my own clothes! Even with tidy guide lines in the fabric, I can't sew a straight line to safe my life. :( The other six are being hand sewn and I'm half way done. I'll post a quick show and tell in a few days when they are ready. 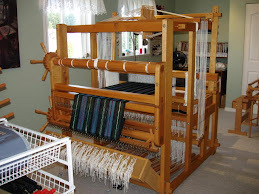 Okay, now that the warp is off the loom, I raised the treadles that were used in this project and then weighted them down from above. I purposely chose a darker colour for this warp so it would hide possible skips as the shed was a bit wonky in some places. It can be for a time until you have worked out the kinks. Its a hassle but well worth it for the 5 to 10 minute tie up's! The towels warp was a break in project! As you can see the shift is as much as one whole hole, and there was even one cord that shifted two. One hole equals one centimetre (or roughly a quarter inch) Those differences add up at the shed zone. I would remark the spot and snip the old tie off. I only checked the actual cords used so it didn't take long. My favourite tree died this past spring. There was a valiant effort on its part to produce some new growth but it appeared only on the lower branches and just little tufts of fresh green. Eventually, these faded and we have had a gentle rain of needles and pine cones falling with every gentle breeze. I wrote about the decline of the tree in this link. It turns out that Global Warming didn't kill the tree and neither did tiny 'silkworms' but we'll disclose what the killer was later, as in all good murder mysteries! With winter coming and also the anticipated wind and rain storms, we felt it was time for this old duffer to come down and make a graceful exit rather than invite itself into the house at some point! Its estimated height is 110 feet tall and would be a heavy knock on the door! Douglas Firs are common here on the west coast and formed the back bone of the lumber industry here in BC. They are tall giants in the forest when left in peace to grow. Places such as Cathedral Grove show these trees in all their quiet majesty at 300 to 800 years old. We have done a couple of trips to Cathedral Grove and will no doubt go back again. Its quite the experience standing next to, and touching an 800 year old tree. Leif is getting his gear in order as he's the one going up the tree, and Kevin is getting things set at the truck. Well, there will be body parts to dispose of! I had a front row view of the proceedings from the upper deck and so kept my camera handy. Since it took all morning to do, I took the camera to the studio while I wove and would step outside onto the lower deck and snap a picture or two at crucial moments. Here Leif is working his way up the tree, cutting and throwing down branches as he goes. The first clue in the mystery can be found towards the bottom of the tree trunk in this picture. As you can see from this close up of Leif as he works, its a very physical job and he's carrying a lot of equipment and safety lines with him as he works. Soon he was as high as he could go. He said the view was great from up there! Leif tied off a lone line to the upper portion of the tree and was careful as to where he set the knot. More on that detail later. Below, Kevin, who had been enjoying just watching till this point, now took the line and made ready on the ground. Leif cut wedges with his chain saw and then got back out of the way, while Kevin pulled tight on the line and down came the top 35 to 45 feet of the tree! ... and it fell exactly where they wanted it. Not on the wood shed, or the hedge, or further to the left of the picture where the septic line runs underground. The key to this success Kevin told us, was the location and the angle of the notch that Leif made prior to making the back cut. It determines the direction of the fall. There's no doubt that this is an art form and is also very dangerous work for those involved. Mistakes can be fatal at worse. The tree came down in manageable lengths: Leif would tie off the line to an upper portion and then make his cuts a few feet below. With each section the trunk was getting thicker and thicker and so the effort involved was greater for both of them. Leif with cutting and Kevin managing the falls. Here's Leif out of his gear talking with Bruce. Who does he resemble to you? Yeah, I thought so too. This is when the men noticed a strange crack in one of the rounds that ran through the heart wood. It was a shear fracture. They checked consecutive rounds and determined it ran for many feet of the tree. Look closely at the large log round on the bottom right.... you can see the holes made by the bird. So what gave the tree such a blow as to crack it into two? A blow to the back so to speak? Why that would be the big tree that fell, and took two or three others with it a couple of years ago. I was sitting on the couch having my early morning coffee when I heard a enormously loud CRACK, crack crack.... I watched in horror as this tree, these trees were falling towards me and the house!! But this one lone soldier had taken the blow, the brunt of the fall and literally they changed direction and fell neatly behind the hedge and into the steep ravine on the other side. Later inspection showed the main large tree that had fallen had a condition called 'cone rot'. The smaller trees were just casualties of the big one coming down. It also seems my nice tree, that became my favourite after that day for saving us all from ruin, was also a casualty. Jens, who owns Beechwood Tree Service looked at the shear fracture damage in the rounds and told us that with the tree being standing dead for just under a year, reasonably dry, and with the coming strong winds, there was a good chance it would have have snapped off at the fracture this winter. No telling where it would fallen! Its time had clearly come. So the damage had happened from the back side of the tree where it hung out over a steep ravine. The split was not noticeable from our view at the house, so the cause of death was a best guess. Only the autopsy proved the true reason. They cleaned up well and you'd never know that they had been there except for a light depression in the ground where the tree section had fallen flat (and not point down) Oh, there was some inconvenience felt! This spider disappeared into the wood shed during all the kerfuffle! The very next morning, we found it had completely ripped out the old web and rebuilt new over night. Things are back to a new normal again. A tree's age is determined by the number of rings it produced..... see if you can work out how old this 110 foot tall tree was. Click to enlarge and give it a try! Post your answer in the comments. :) Start counting from the centre out to the bark. Back soon with a regular blog post.... I'm weaving as fast as I can! Don't you just love dahlias? They are the one flower that I enjoy having in the house. The rest I leave outside and enjoy them there. When it comes to weaving, I have been exploring the ever complex twill and after a while, you start to wonder where to go next. Still mulling over my options, but for now I'm still with twill but less complex in the draft, threading and treadling. It makes a nice change actually! I've offered you glimpses of them under way here and here. I wove Swedish 'drall vav' kitchen towels (or turned twill) as my first project when I got my Woolhouse Tools loom brand new back in the summer of 1998 and it was time to revisit it again. This time I'm using 8/2 (or 2/8) tencel in deep teal, sett 24 epi. I'm using 8 shafts and so have two blocks of 1/3 and 3/1 twill. Here's the purple one on the fringing board. I left about 12 inches for fringes as I like lots of room to move. Coral looks rather peachy here doesn't it against the teal? I like to get out my beads and look at all the options available but usually settle on 2 to 4 types and make it up as I go along. The first couple I play with and then go with my final choices the rest of the way across..... and the other end of the scarf of course! I have fun with this part and it didn't take too long to get them all done. Next up was hand washing them in the laundry tub, a spin out in the washing machine and hanging to (nearly) dry. They were still damp when I gave them a good hard pressing this afternoon and then trimmed up the fringes neat with a rotary cutter. I think they turned out great! What do you think? The purple / teal combo sure had drama and is quite iridescent. Enjoy the last flowers of summer.... I have the vase in my studio and thought I'd share them with you. Its the Start of a New Weaving Season!